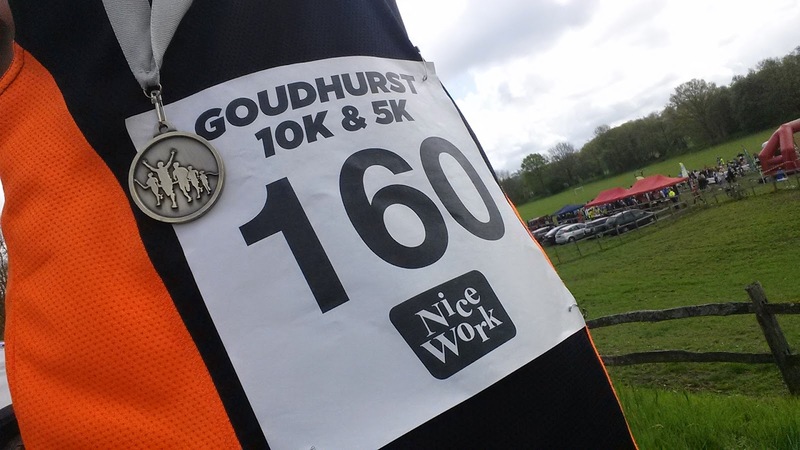 The Goudhurst 10k is organised by Nice Work and takes place on the country lanes around Goudhurst and Finchcocks in Kent. 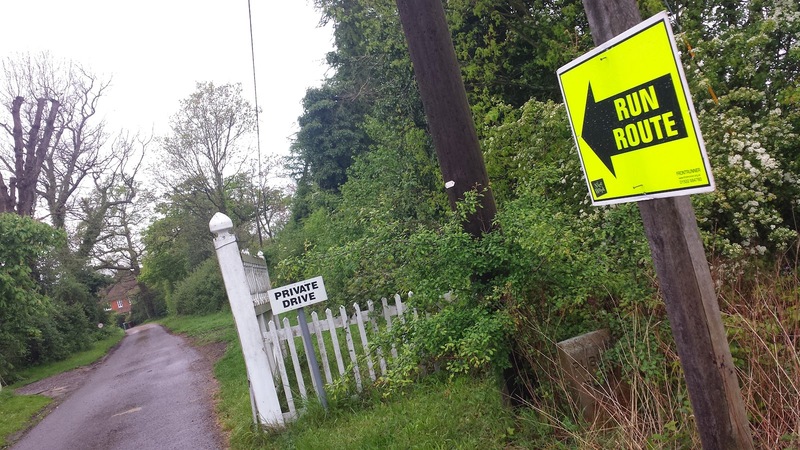 The race HQ, start/finish, toilets and ample car parking for the run is at Risebridge Farm. 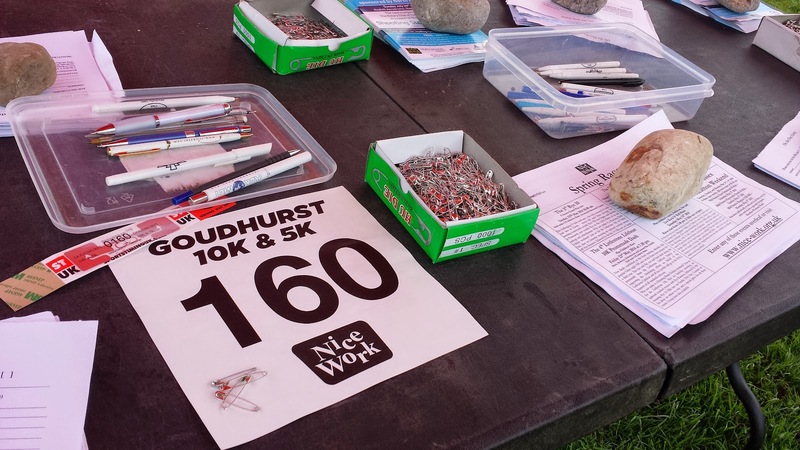 I entered this race at short notice (I tend to do that these days) and paid the £15 entry fee for unattached runners. Attached runners paid £13 for advance registration. On-the-day entrants paid an extra £2). Because I entered fairly late, I had to pick up my race number and timing chip on the day. The race start time was set at 10:30am, so I arrived in good time and milled around checking out a few parts of the course before starting to warm up. I think at this stage the toilets deserve a special mention - I arrived expecting to find the standard portaloos, but not here. Here there was a portable toilet block containing male and female sections, but these were very fancy. 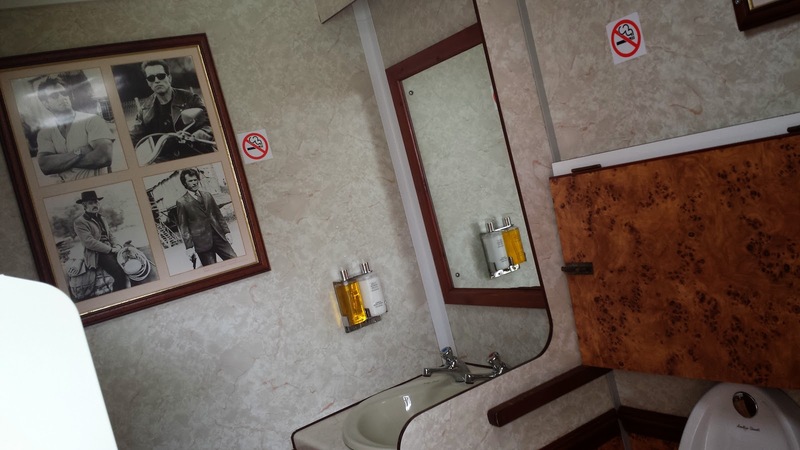 Not only did the toilets have real doors and door handles, they also had a proper sink, fancy hand wash gel and hand cream, plus to top it off, they had photographs of movie stars in frames hanging on the walls! Awesome. So after having an audience of Clint, Arnie and co. in the gents, it was time for the proceedings to get under way. 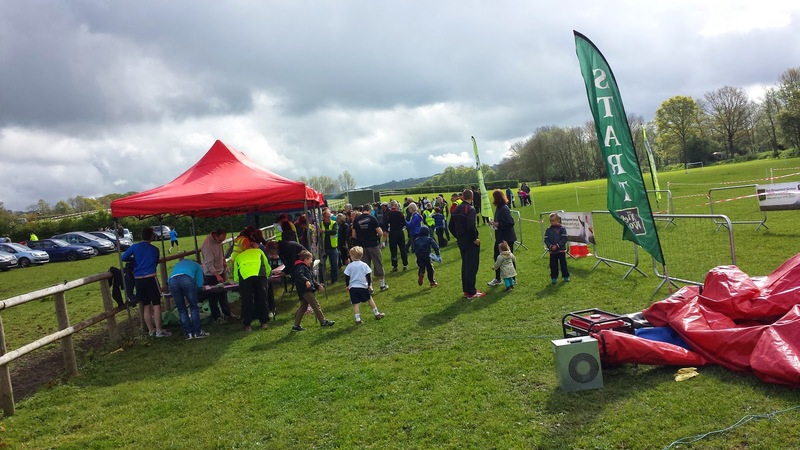 The 10k was not the only event to be taking place. There were two children's races, I believe - one for the very small kiddies and a proper 2k race for the older ones. Then we moved onto the main event, which itself consisted of two separate races - the 10k and a 5k. 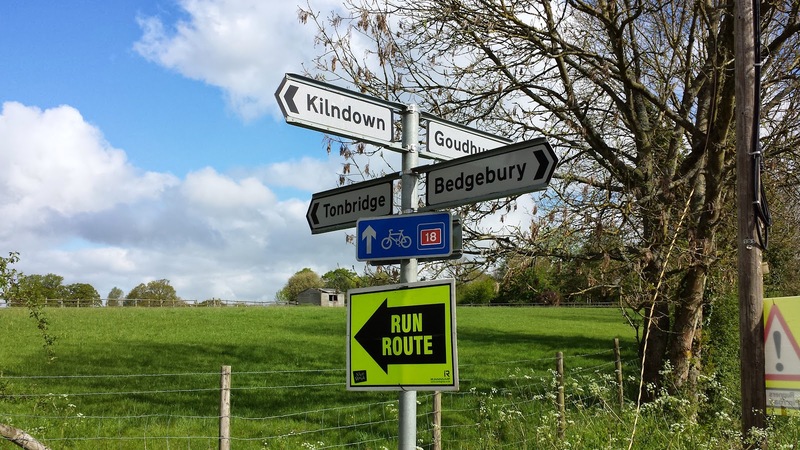 The course that we ran on the day was not the same as the one that was shown on the race website, and I had a feeling that would be the case as when people were describing the course to me beforehand it wasn't quite matching up with what I had seen online. The route that I thought we'd be running looked like a good split between road and trail, but the actual course was mostly road. 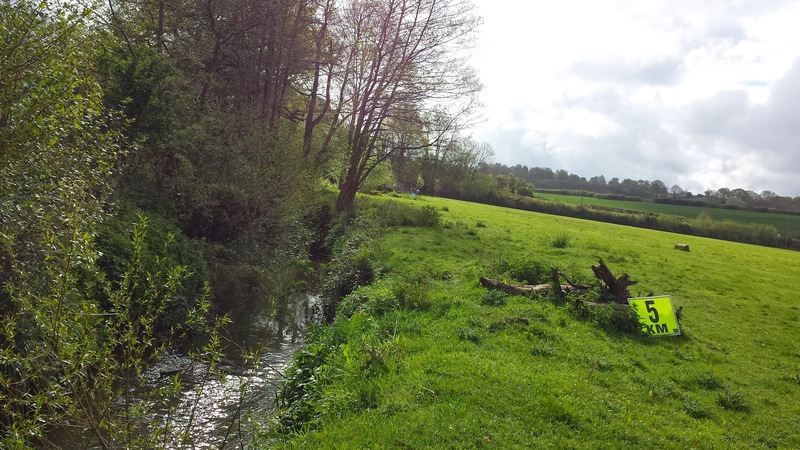 Anyway, the course was well signed and marshaled so I was happy to just take it as it came. The route we ran was a 2 lap (for the 10k) course with an out-and-almost-back section at the far end. 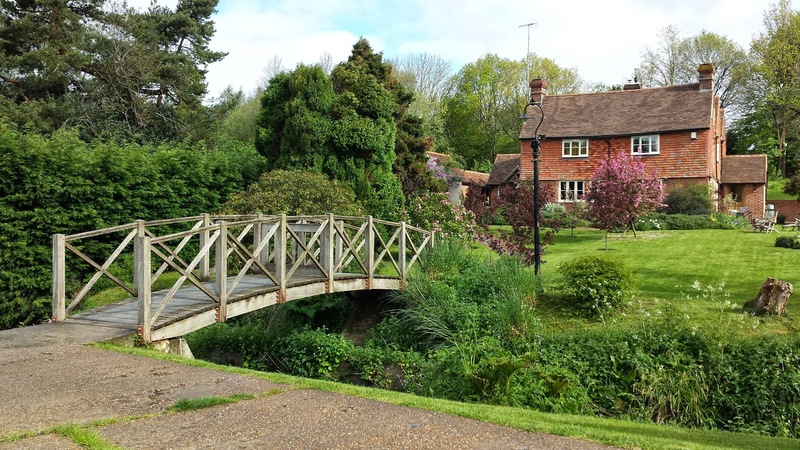 We started off at the farm with a lap of the field before heading out onto the small country roads via the Risebridge Health Club. A few minutes later we turned onto a private road and headed towards Finchcocks for an out-and-almost-all-the-way-back section. 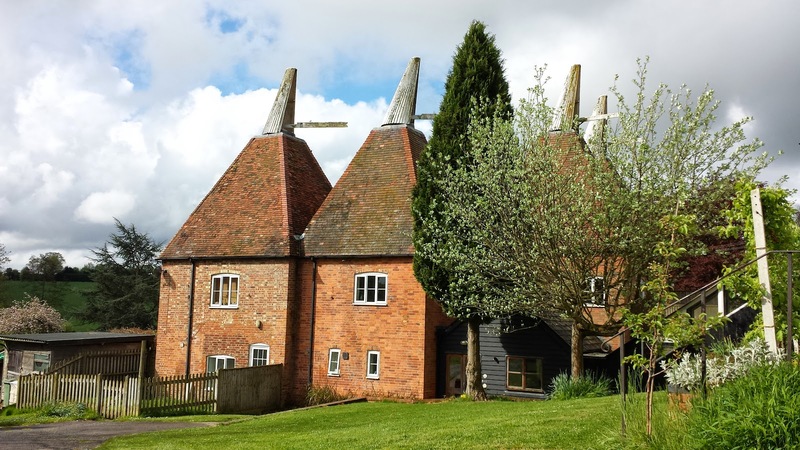 The scenery was exclusively farmland all the way around, and I remember seeing some sheep with their lambs and some horses while on my journey through the undulating Kent countryside. Just before the 3.5km point, the runners reached the turnaround point and headed back along the country lane in the opposite direction. It was nice to see all of the other runners as I ran back along the country road. Just before the 5k point, the back section of the out-and-almost-back turns off of the lane and goes through a grass field. Here there was a bit of a headwind which made it a little tougher. 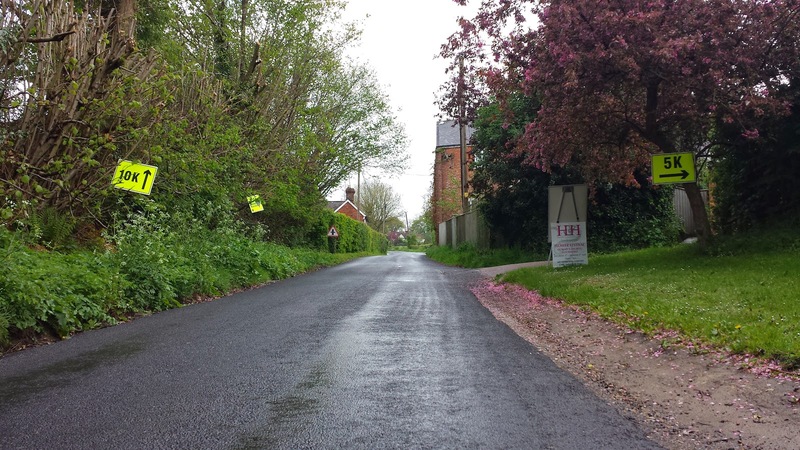 At the end of this grass section there was the water station and then runners had to make their way through a small gate (with the gate removed), up a short sharp driveway and back out onto the country lanes. From here, it was slightly uphill back towards the farm. When reaching the farm, there was a split in the course. For those running the 5k, it was time to turn back into the farm via the health club. But for those here for the 10k, there was one more lap of the course to go. I'd like to note that although there was a 5k race going on, the 5k marker was way back in the middle of the grass field (and my gps logged it even earlier than that). 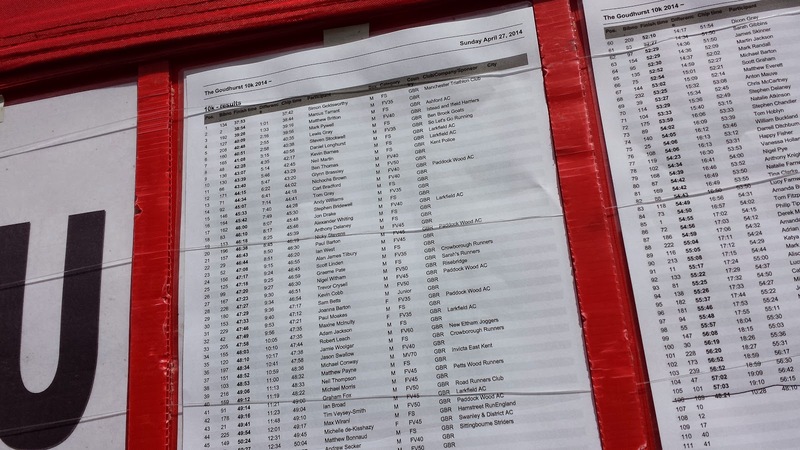 So it looks like the 5k race was infact a 5.7k race. I headed off for my second lap and in the process continued to progress through the field of runners until, right near the end, I was right on the shoulder of the 7th placed runner. Sadly I couldn't quite get past him and at the end of lap 2 turned back into the farm, past the health club and down onto the grass field where it all started, crossing the line in 8th place. My time was a little slower than I was hoping for and I'm wondering if this was down to a slightly long course. The readings from my gps device recorded it as 10.3km - it's difficult to know which is correct as it's all satellites and the data isn't always 100% correct. So I was happy with my 8th place finish (which was originally 6th, but then two more names appeared in the official results after the race) but disappointed with my chip time of 40:38. My gps splits have me down as running sub-4 minutes for each kilometre apart from the sixth, ninth and tenth kilometres, which should have brought me in about a minute faster than my actual time. There were kilometre markers out on the course, but I don't think they were all positioned accurately. For example, I reached the 1km marker in 4.28 - I was definitely running at a faster pace than that and my gps readings have me reaching 1km in 3.55, but not in the same place as the marker. It's not a huge issue and I don't want this to turn into a whinge fest because bad points aside, I really did enjoy the race and thought everything was very well organised. Once across the finish line, I was presented with my medal and grabbed half-a-banana and a cup of water from the refreshments table. A short while after the provisional results were available - at this point I had been recorded as coming in in sixth place, but as I mentioned before, the official results have two additional runners in front of me. Not quite sure what happened there. I hung around for a while after and watched the presentations before heading back over to watch the last few runners coming home and had a bit of a natter with one of the marshals. All in all it was a great morning of running and I came away happy that I had made the decision to enter the race. Official results are recorded on the nice work blog and on the race timing systems website.